Hi everyone...can't believe it's been a week already. I have so many things to post about, but the days just fly by. How does that happen? Do you remember in last week's TTT post, I had mentioned I bought a little item along with the magnet and tape measure from the automotive store. Here she is. 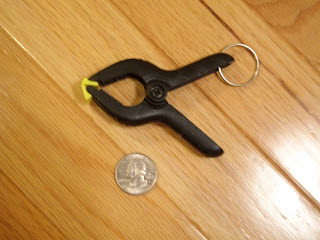 It's a little baby spring clamp, that's also a key chain. Here are her big brothers and sisters...you can find them in most any store, in many different sizes. Below are a few uses for them. This first picture is for the little spring clamp key chain. You can clip it to the top of your purse, so you know exactly where your keys are in the morning when you are rushing out the door. 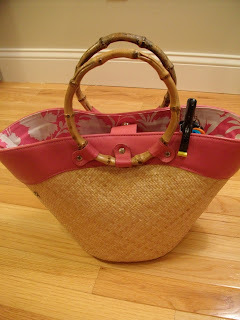 If you don't want to clip it to the top of your purse, you can clip it to a pocket on the inside. It's so much better than digging through your whole bag searching for your keys. 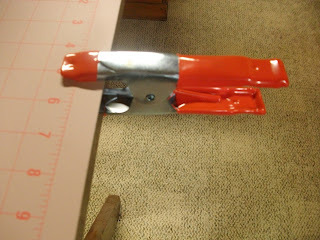 Let's move on to the sewing room...how about clamping your rotary mat to the table so it doesn't move around. They do stick out a little, but mine are on the side where no one walks by. This next picture is helpful for basting your quilt. 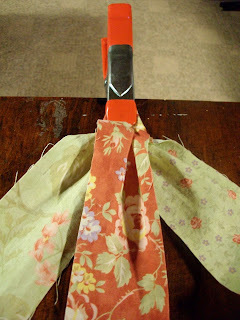 You can clamp your backing material to the table, then layer your batting and then the quilt on top...baste as usual. I always tape my backing material to the floor in the kitchen, but using clamps will help keep it taught on a table and eliminate bending over on the floor. You may need more clamps and maybe test it out first if you are using you dining room table!! This table below is a great old table in my sewing room, so I don't care if it get dinked. The next use I thought of is to use it as an extra hand. 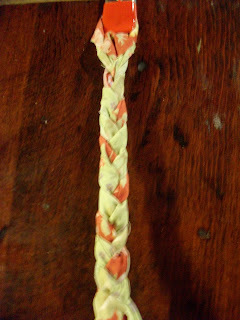 There are so many great blogs out there that have made braided rugs or baskets with braided fabric. 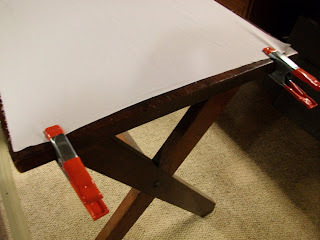 Now you can clamp the 3 pieces of fabric together on the table and braid away. This next idea is one that I use alot. 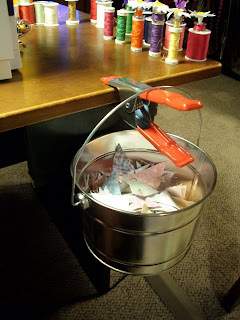 When I'm sewing and I make all the extra triangles or use leader and enders, I squeeze a clamp right next to me on my sewing table and hang my little bucket there (also from Home Depot in the paint section). When I make all these extra pieces, I just throw them in the bucket. Before you know it, the bucket is filled and I have the makings of another little quilt in there or squares for a border. The intended purpose of the spring clamps is for woodworking, but I'm sure there are so many more uses for them in our sewing and crafting world. If any one else uses these or can think of another idea for them...I hope you can share your thoughts with us!! I'm a little late getting here, it's not Tuesday anymore, but I had to visit to see what you came up with for Tool Time Tuesday! I just love all the ideas you are sharing. You are so smart! Thank you for sharing many ideas. You certainly have found a lot of uses for those clamps. I bought some at one time and my husband borrowed them for a project and I never saw them again. LOL! I love the use for them in the bottom photo. Ha! And guess what my husband just bought me from Fleet Farm? -- a bag of these things! Of course, I only wanted them to hold my quilt tops down as I am basting them, but he will be pleased as punch when he sees all of the different ways I can use these! Thank you for the great uses! Very cool. Love all the ideas! love it, love it! 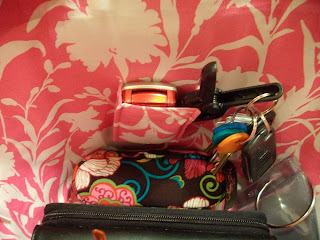 I can NEVER find my keys in my purse -- must find one of those little ones immediately! Karen....great ideas! Thanks you so much! Fabulous ideas for clamps! 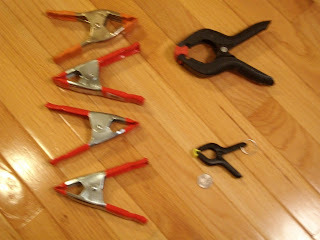 I have clamps in all sizes at my workbench, but none in my sewing room! I'll have to change that! I don't know which use is my favorite! I like the basting idea. I love this idea. My sweetie has so many clamps and when I was spraybasting my quilt I wish I'd thought of this. so absolutely easy to attach to a table. You are unbelieveable. I especially like the idea of the key holder. Now if I could just find a way to locate my pocketbook when I am in a hurry!! Love the clamp and bucket idea. Also, the magnet from last week. I could have used that last night! In the last picture, what are the things with the flowers connecting the bobbins and thread spools? Are they pencils or something else? I say this every week....AMAZING!! I think we even have some of them in the garage..well not the bitty one, but some of the brothers and sisters! Another great idea!! Thanks for sharing..I need to put these on my list of thing to get now! I'm gonna raid hubby's woodworking shop now. lol Great ideas. These are such great ideas! Thanks!